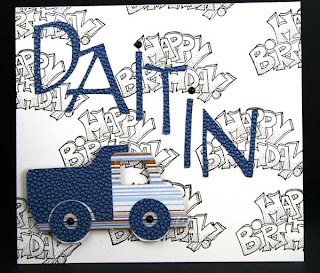 Bleydn wanted to help make Daitin and his birthday cards, and I know how the little ones love pushing the buttons on the Cricut. So, I made these two cards very "guy" like and simple. 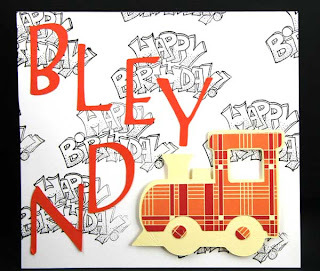 I first stamped Happy Birthday all over the cards, cut out and paper pieced the train and truck with the Cricut Mickey and Friends Cartridge and then cut out their names out using the George cartridge. Little kids love to see their name ,even if they are too young to read. So the cards aren't frilly today, but they fit my boys and that is what it is all about. Mazelee's birthday is next month and I can make a girly card for her. Thanks for stopping by today and visiting with my family. Such cute boy cards! Which cricut cartridges did you use? I have a nephew turning 1 on the 28th. I used Mickey and Friends for the truck and train. George was used for the fonts.